Kate Middleton is so beautiful and the newest of the royalty sweethearts that the world has come to love and recognized in a heart beat. She is a new mom and just seems to keep going with ease and a smile on her face. This mask is a simple picture of Kate Middleton with a short hair cut and a big smile on her face. The Kate mask measures approximately 11 inches by 10 inches and will fit an average face. It is made out of cardboard, has an elastic cord to keep the mask on your face and it has cut out eyes for easy sight lines. What an easy way to turn into someone completely different. You can use it for a last minute costume party or just to become Kate. 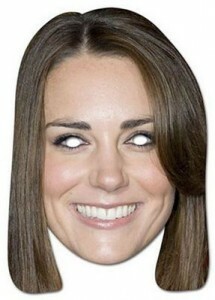 Either way, get the Kate Middleton Cardboard Mask today. She is so beautiful and radiant everyday. She is Princess Kate Middleton. Now you can bring her into your home to add a ray of sunshine to all the cloudy days. This Kate Middleton doll depicts Kate on her engagement day with Prince William. She is wearing her “royal” blue engagement dress, a wonderful smile and it comes with a second dress that was worn in the official engagement picture. This is a limited edition collector’s doll that measures approximately 16″ tall. It comes with a doll stand, it is hand numbered and comes with a matching certificate of authenticity. It is made of fine porcelain and is hand painted. There is no better piece of royal history than this Kate Middleton Engagement Doll created by The Ashton-Drake Galleries. The Duchess of Cambridge has impecable style that rival any, she is beautiful, smart and has many followers who just adore her. If this is you then you may want to take a close look at this 2015 wall calendar. Featured on the front of this calendar is Kate in a very astonishing floral dress looking amazing, inside you can see high quality images of many famous styles and fashions that Kate Middleton has chosen to wear in the last while, and see her walking with Prince Willliam as well as some fun unique hats she has dawned. The 2015 calendar has traditional style binding to fasten it together and is a standard wall calendar sizes of: Closed: 12.0″ x 12.0 “, Opened: 12.0 ” x 24.0 “. 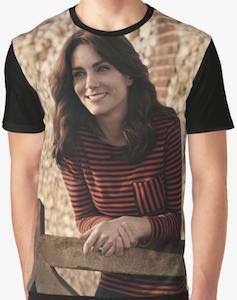 Show off your support for the royal family and spend the year 2015 with them.